This post follows on from “warriors”, which sets the frame for a symbolic approach to the virabhadrasana triptych. I write in first person because I dare not assume that everyone’s experiences are the same as mine and because I don’t know who “one” is. The warrior asanas are all standing postures starting off from a wide stance with the front foot parallel to the long edge of the mat and the back foot at an angle smaller than 90° with respect to this line. 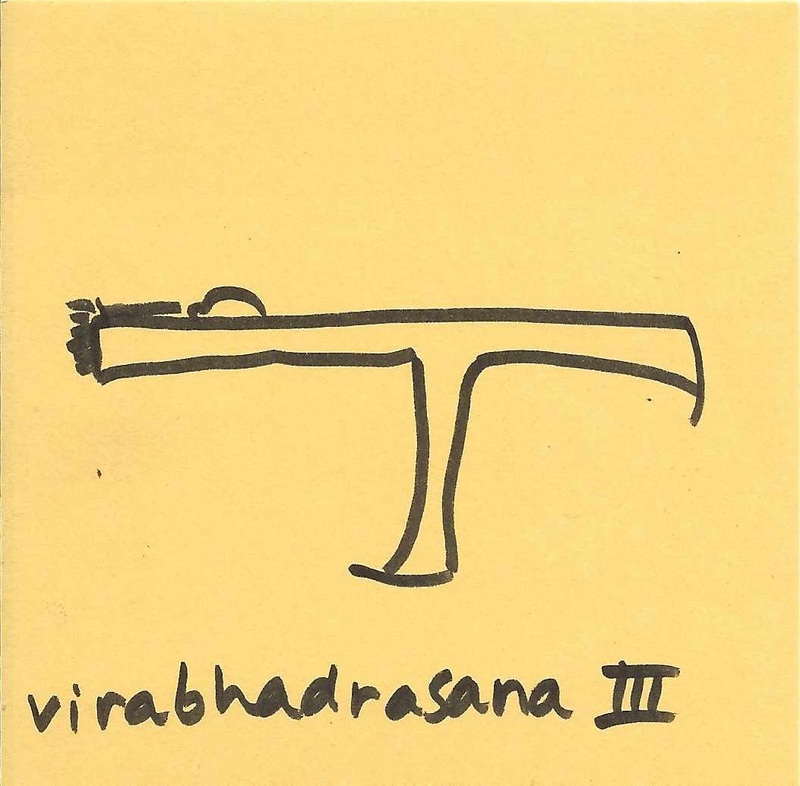 Both virabhadrasana I and II keep both feet on the ground. 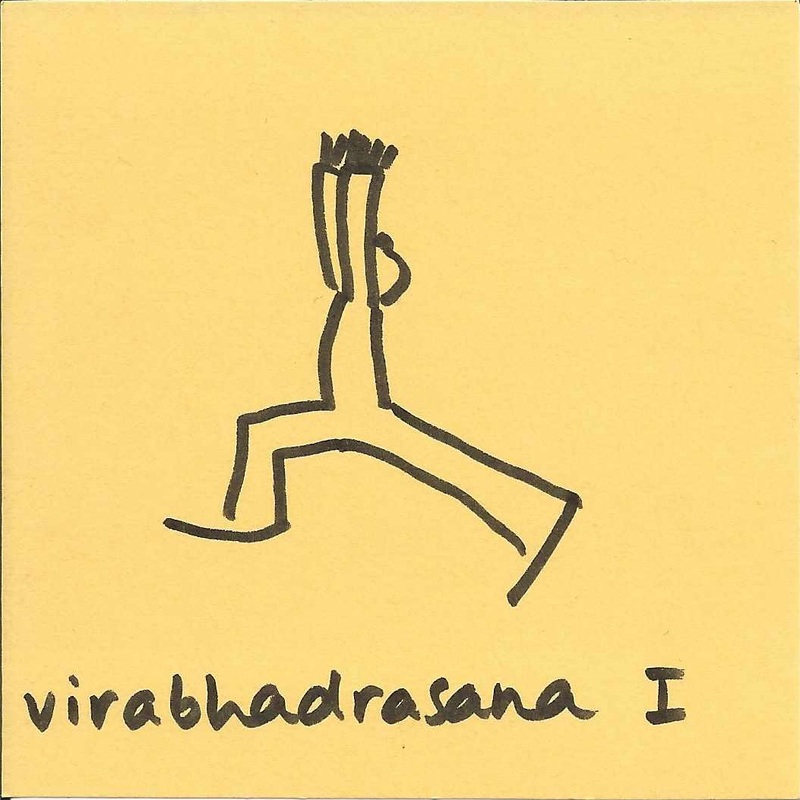 In virabhadrasana III the back foot is lifted off the floor to come into a balance position. In virabhadrasana I the hips are facing the front, that is, they are facing the same direction as the front foot. In the classical arm position, the arms are stretched overhead with palms together. In the full version, the gaze is directed to the thumbs. The first thing I notice in virabhadrasana I, even from the initial foot position is that my body could shift weight onto the front foot and take a step forward. Then, when I’m in, the sense is of verticality, while the pelvis is grounding through my very active legs and feet, the top half of my body is lengthening upward, with the arms and gaze prolonging that direction. The sensation of mula bandha is intense and adds to the sense of energy going up. I don’t see the ground, I’m looking at the sky, and that teases my balance. In virabhadrasana II the hips are facing sideways, so there is a big turn-out in the front hip which makes the sensation of mula bandha not so intense – I feel like the bottom of my pelvis is more open to the ground. The arms are stretched to the sides, so they are each over their own leg. The chest is facing the side too, but the head is turned towards the front foot. In this position a step forward doesn’t come natural, I feel like it’s more about stopping. Amongst other things because, where is forward? The pelvis and chest are facing one direction and the front foot and head another, while my arm position and my gaze are connecting to the horizon. It feels very horizontal and related to earth. So: sky and earth. Heaven and earth are the first two hexagrams of the I-Ching or Book of Changes, the ancient Chinese oracle. The I-Ching is a detailed description of existence – of how things originate, transform and die – based on the interaction of yin and yang. Yang is the principle relating to spirit, it is unmanifested and therefore undifferentiated potential. Yin is the principle relating to matter, it is form and, therefore, limited. Creation is the result of both coming together in equilibrium. 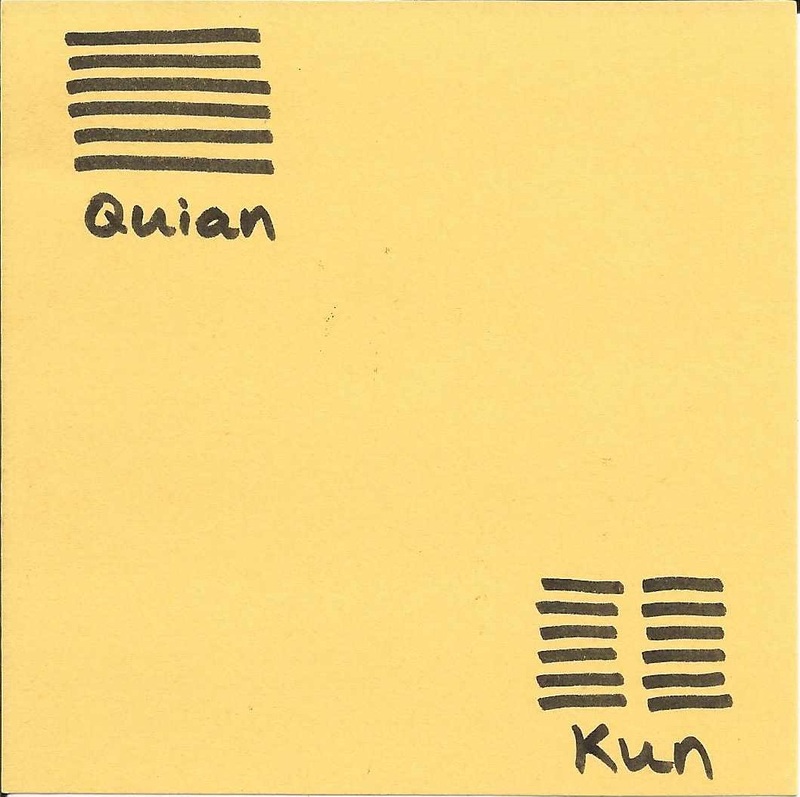 Hexagram number 1, Qian – the creative or initiating, is made of two heaven trigrams. Hexagram number 2, Kun – the receptive or responding, is made of two earth trigrams. Qian is yang and Kun is yin. Moreover, Kun is related to space, over which we have choice; whereas Qian is related to time, which we cannot choose. Qian is the inapprehensible, whereas Kun is the material. Going back to the symbolic approach to warrior asanas, virabhadrasana I and II seem to me to be working on these two principles that the hero needs to bring together. Without the inspiring qualities of yang, coming from heaven, no hero sets out on a journey. Without the yielding qualities of yin, coming from earth, there is no acceptance of the limitation of the reality, and the initiative remains a fantasy. Too much yang brings rigidity and hubris – the arrogance of humans defying the gods, like Icarus. Too much yin brings laziness and complacency. The path of the hero requires the inspiration of potential, the vision of what is possible, the aspiration to go beyond and to transcend. I can tune into these qualities and refine them in virabhadrasana I, with its direction up and forward. On the other hand, infinite possibility can only become something by accepting limitation and becoming finite, and without humbly surrendering to this truth nothing comes to be. I can tune into these other qualities and refine them in virabhadrasana II, with its sensation of settling. 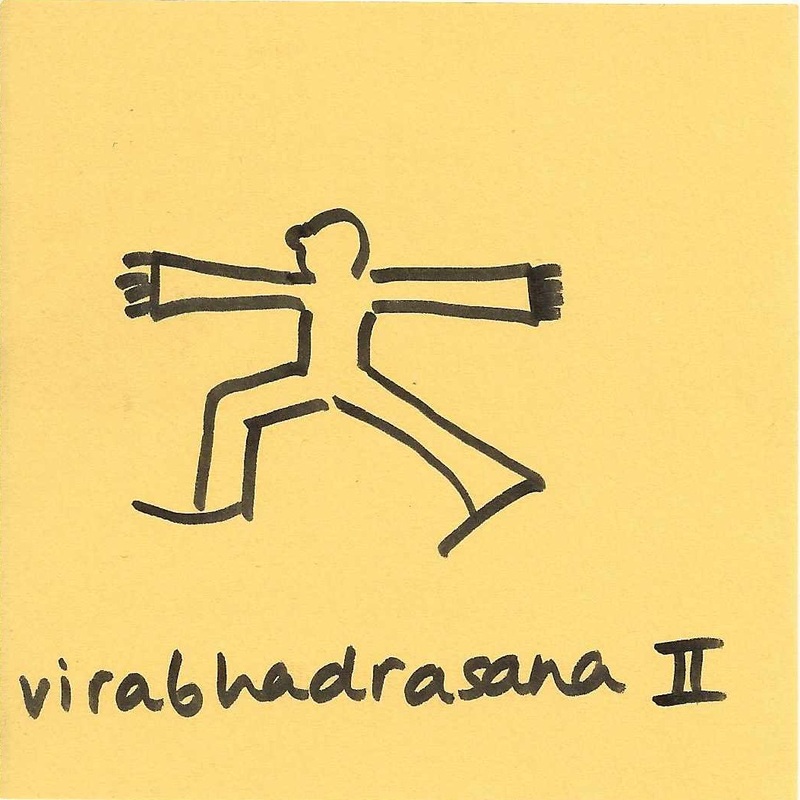 And where does virabhadrasana III fit in? When I am doing it, it feels like virabhadrasana I has become horizontal. Although the arms and gaze extend the direction of the spine, they are now parallel to the horizon. Coming into it by leaning forward from virabhadrasana I, feels like a matter of coming down. Coming into it by turning forward and bringing my arms together from virabhadrasana II, feels like a matter of taking off. The fact that it is a balance seems to be a beautiful synthesis of the heaven and earth principles coming together; and in terms of the hero’s journey this means remembering that I am as much a child of heaven as a child of earth, connecting to will and strength as much as to acceptance and letting go in order to continue making progress on the journey towards realization. P.S. The day after posting this article, I was listening to an interview with Sant Baljit Singh which provided another inspiring reference. He said that effort only procures material things, whereas spiritual awareness only comes through doing nothing – once seated in meditation, that is. So sitting down in meditation is just sitting peacefully, doing nothing. The first step is orientation, and then all that remains is putting will aside to allow what is to manifest.